Paragraph 1.2.5 provides all information regarding spread footings. The following example con-cerns a simple spread footing with its footing shaped like a box. 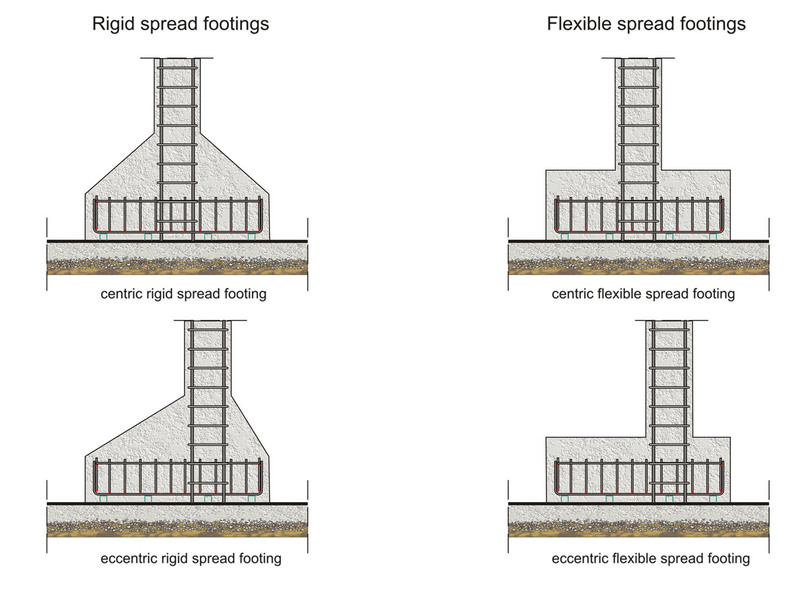 The spread footing behaves like an inverted cantilever with loads applied in the upward direc-tion. As a rule, a spread footing is a quite rigid element therefore, the applied soil stresses are almost linear and in case of a symmetric (with respect to the pedestal) footing, they are or-thogonal. 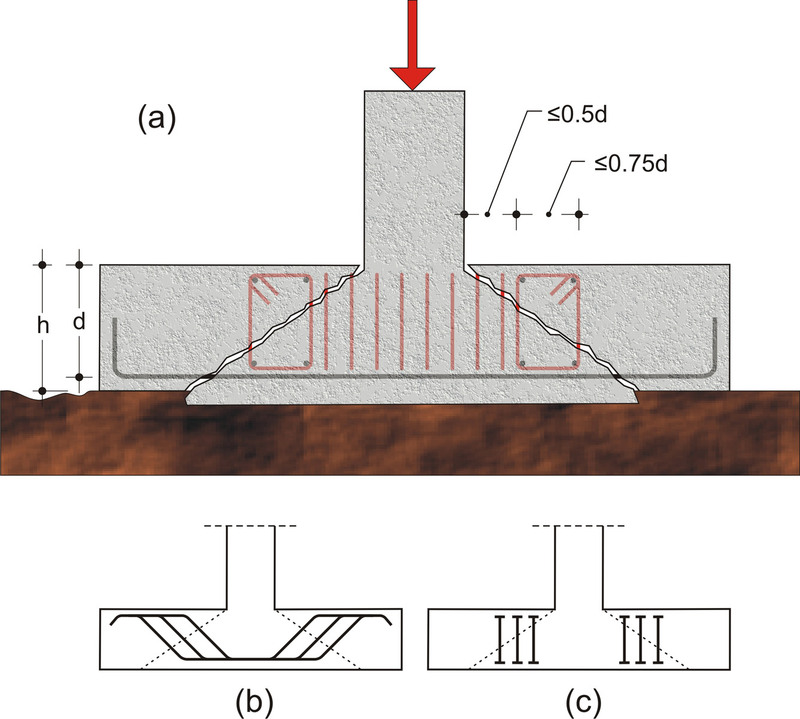 These soil pressures constitutes the loads carried by the footing which behaves like a slab and is deformed in the way shown at the following figure. The real deformation is in the order of a millimeter and although it is not visible to the human eye, it always has that same form. The reinforcement is placed at the lower surface of the foot-ing both along the x and y axis. 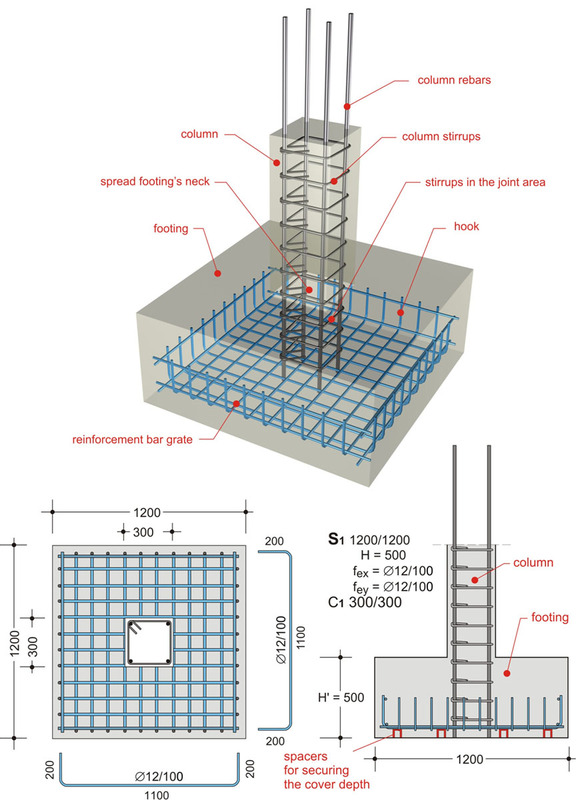 The column rebars can be anchored inside the footing either with a straight anchorage length or with a 90ο hook at their end (resembling a ‘shoe’). The chosen type of anchorage depends upon the footing’s total depth and the level on which the column is considered fixed which is usually the upper part of the adjacent connecting beams. Most of the times, that level is high enough to allow for a straight anchorage length. Practically, the need for hooks at the base of columns arises mainly in the case of a solid raft foundation with a relatively small slab thickness. 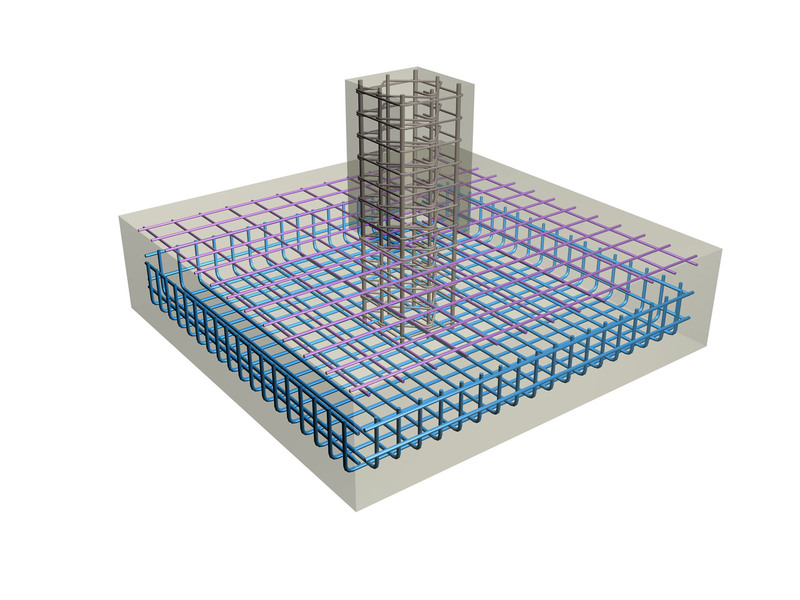 The reinforcement is the same both for flexible and rigid spread footings either being centrically or eccentrically constructed. The footing is reinforced with an orthogonal wire mesh that may have horizontal and vertical bars of different diameter and spacing. Bending the rebars ends helps in the proper anchorage of the reinforcement. 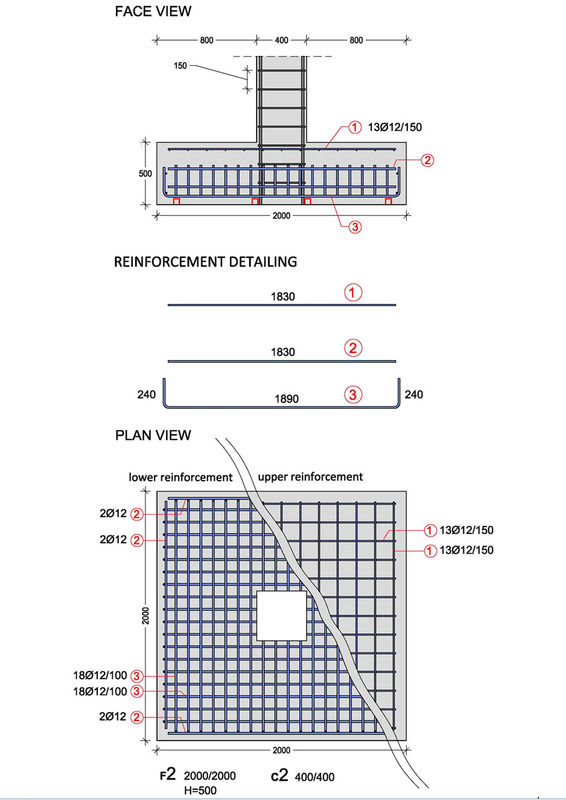 According to the rule of practice, the minimum allowable rebar diameter in a footing is Ø12 and the maximum acceptable spacing between the reinforcement bars is 150 mm. 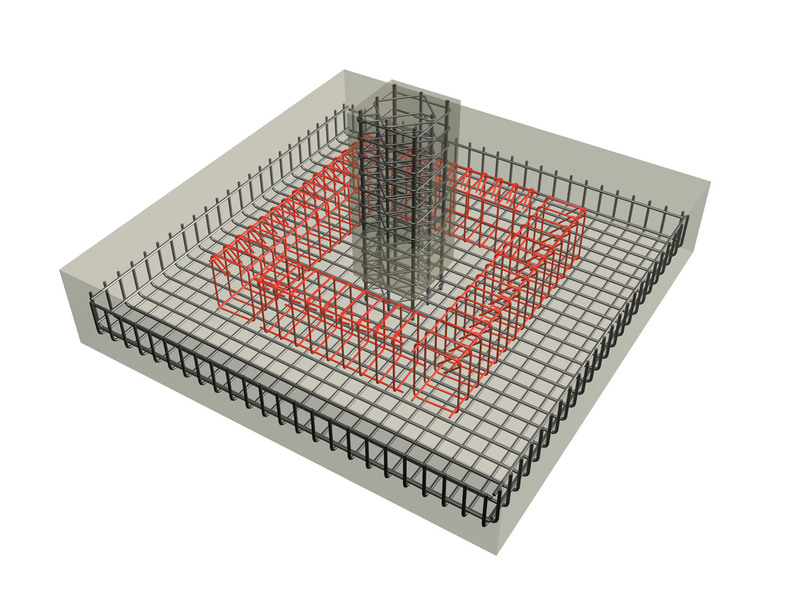 In certain occasions, the footing may have a reinforcement wire mesh both at its upper surface (see following figures). In some other cases, the spread footing may have punching shear reinforcement as well. 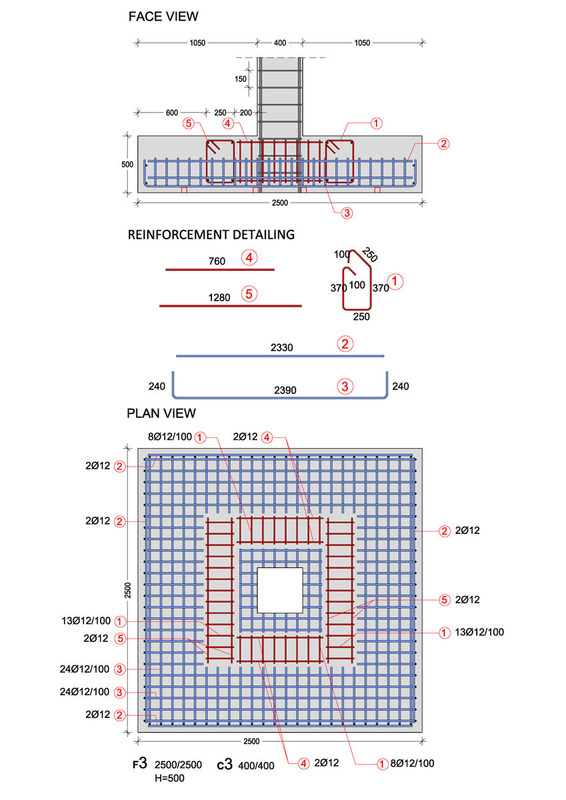 This reinforcement is usually provided in the form of a peripheral stirrup cage. Controlling punching shear, with the use of stirrup cages. Punching shear stresses are similar to the shear stresses (diagonal flexure) and they appear along the perimeter of the column. Punching shear is a type of column sliding along the side of a cone that forms a 35° angle with the horizontal axis, as shown at the opposite figure. The first stirrup leg must be placed at a maximum distance of 0.5d away from the face of the pedestal and the last stirrup leg at a maximum distance of 1.25d. 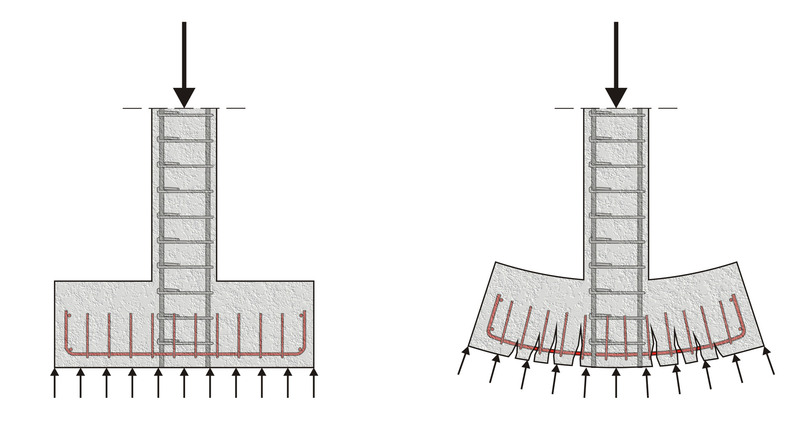 In this specific spread footing, punching shear is controlled by stirrup cages (figure a) however, it could be also controlled by bundles of properly bent-up rebars (figure b), or by special industrial elements (figure c).